Details at the end of this post on how to enter to win a copy of Behind Chocolate Bars. We also have a link to order it from Amazon, and from an indie bookstore where a portion goes to help support KRL. As Halloween approaches, Michelle Serrano isn’t surprised that her business partner in Chocolates and Chapters has been enlisted in organizing the West Riverdale Halloween Festival. The organizing whiz runs the rare-and-used bookstore half of their combination chocolate shop and bookstore, and Erica Russell is more than capable of helming the planned haunted house at the Boys and Girls Club. For Michelle, Halloween is the opportunity to elevate the traditional candy to gourmet status, and she loves nothing more than blending flavors and designing new innovative truffles. The haunted house isn’t the first place to reveal a body, as just a few weeks before Halloween the battered corpse of Faith Monette is discovered in the abandoned Green Meadows Estates. Nicknamed the Cuesta Verde after the Poltergeist movies, the woman’s presence there is as inexplicable as the evidence that links the murder to Chocolates and Chapters high school intern. Michelle and Erica believe in Dylan Fenton’s innocence, but his fellow Super Hero Geek Team comic book club members are obviously hiding a secret that relates to both Dylan and the dead woman. With local newspaper blogger Reese Everhard stirring up panic with lurid headlines, Michelle and Erica feel compelled to clear their young employee. Michelle’s boyfriend Benjamin “Bean” Russell, a famous investigative journalist as well as Erica’s brother, lends his considerable detective skills alongside Erica’s tech guru Zane West. Far less enthusiastic about Michelle’s endeavors is her brother Leo, whose PTSD has been heightened by a recent motorcycle accident. Unfortunately, the more that Michelle and her friends learn about Faith and her abuse of social media, the worse it looks for Dylan. This deliciously entertaining Chocolate Covered Mystery isn’t afraid to delve into darker themes, most notably Leo and the traumas that continue long after the war in Afghanistan. His moments of paranoia, anger, and depression balance out the otherwise light tone full of good-natured humor. Timely issues concerning online identities also take on a large role, yet in the end everything circles back to basic human nature. 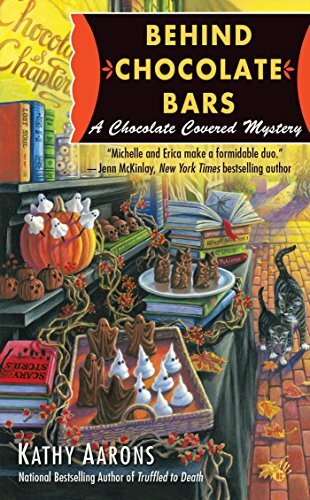 Michelle’s moments in her kitchen developing chocolatey goodness will attract many fans who appreciate this cozy genre, but it is the deft-plotting and genial and relatable heroine who will have them returning for more. 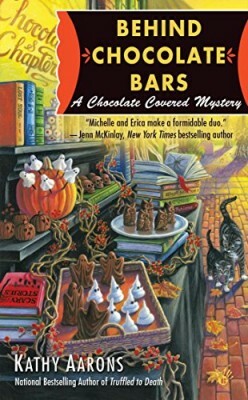 To enter to win a signed copy of Behind Chocolate Bars, simply email KRL at krlcontests@gmail[dot]com by replacing the [dot] with a period, and with the subject line “bars,” or comment on this article. A winner will be chosen October 8, 2016. U.S. residents only. If entering via email please include your mailing address, and if via comment please include your email address. After reading a description of this story and realizing that it includes some serious issues that people experience. I definitely want to get this book and others to follow. Enjoyed this post very much.Thank you. I absolutely love this cover! I loved your review of this book and I can’t wait to read this book! Thanks for the chance! Oh good news…a Halloween based cozy mystery and I love the cover. I would like to enter. Sounds like a perfect read for October! Sounds like a great story. Can’t wait to read it. Thanks for the giveaway. Sounds like a fun book to read. Thanks for the chance. I can’t wait to get my hands on this book! I sounds delightful and delicious. Wonderful series & a Halloween theme is perfect.